These ferns, together with the adder's tongue-like ferns, used to be counted among the so-called eusporangiate ferns. These are ferns with relatively large sporangia with thick walls, producing many spores. The remaining ferns belong to the leptosporangiate ferns, characterized by a small, stalked and thinwalled sporangium containing a much smaller number of spores. Marattia-like ferns still occur in the tropics and are confined to the southeast of Asia. The most well-known representative of this group is the tree fern Psaronius. Beautiful silicified trunks of this tree have been found, among others in the region of Chemnitz (Germany) where they date from the Early Permian (290 million years). On the right is a reconstruction of the tree (click on the picture). The leaves are mostly found separate from the trunks, in different layers. They are called Pecopteris and they are characterized by the fact that the leaflets of the last order, the pinnules (see below for the term), are feather-veined and are broadly attached to the axis. 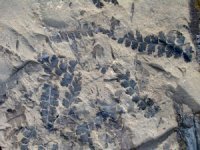 Marattia-like fossils occur also in Jurassic sediments. 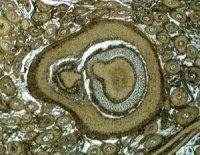 An example is shown in the picture on the left (click on it): it is a part of large compound leaf found in the region of Bayreuth (Germ.). The age is about 200 million years (lowest Jurassic). 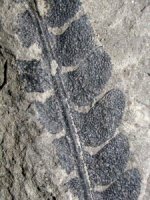 A species is also reported from the famous fossil flora of North-Yorkshire. This one is aged about 150 million years (Middle Jurassic). The resemblance between this fossil and the extant ones is so striking that it is justified to use the genus name Marattia also for the fossil. This group is also called Ophioglossales after the Latin name Ophioglossum for adder's tongue. Also the moonwort (Botrychium) and some other genera are members of this group. The plants have in most cases an undivided leaf and a separate spore spike. They grow in moderate and cold areas and form only a small group. This was the same in the past. Only very few fossils of this group have been found. The oldest among them date from the Paleocene (60 million years): thus relatively young. As said before, most of the living species belong to this group: about 11,500 species divided over 300 genera. Most of these ferns have pinnate leaves, but a few have undivided ones. The sporangia are always united in sori. There are too many groups to describe here, but I'd like to say something about some of them of which also fossils have been found. An ancient order is the one of the Osmundales or the royal ferns. This one is going back to the Permian (250 - 200 million year). There are still three extant genera in this group: Osmunda (royal fern), Todea and Leptopteris with together 16 species, whereas there are 150 fossil species known. An example of such a fossil is Todites from the Jurassic of North-Yorkshire (photo on the left). Cladophlebis (photo on the right) from the same area has leaflets resembling very much those of Todea. Possibly these are the sterile leaves of Todites. From the Cretaceous (70 million years) fossils have been found resembling the modern royal ferns so much, that they are are incorporated in the still living genus Osmunda. It seems that the dimorphism in the royal fern (sterile leaves and separate spore spikes) has come into existence only rather recently. This is an extinct family of ferns with a 'false trunk'. It is composed of a great number of branching tiny stems, embedded in the surrounding adventitious roots (air roots). Not, like in other fern trees, a real trunk surrounded by a root mantle , but frequently branching stems with aerial rootlets filling up the space between the stems. The photo on the right shows a piece of such a root mantle with a stem and many rootlets. The picture on the left is a well-known reconstruction of the Tempskya-'tree'. This family only occurred during the Cretaceous (120 - 65 million years). The origin of this family probably lies in the Jurassic. Klukia (right) is a rather common formgenus within this group. The climbing fern Lygodium, which has nowadays leaves without blades up to 10 m long, is also a member of this family. 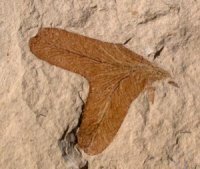 The photo on the left shows a part of a leaf of Lygodium gaudinii from the Oligocene of the south of France (30 million year). In this family of tree ferns five existing genera are distinguised among which the prehistoric looking Dicksonia tree. Many of these plants have hairs and scales on the leaves and the rhizomes (i.e. the horizontal growing subterranean axes). The sori can be situated near the margin of the leaf, but in other species they are covering the whole back of the leaf. 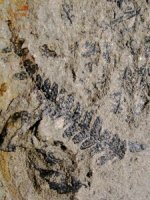 Fossils of these plants are known from the beginning of the Jurassic (200 million years). Examples of fossils are Coniopteris (left) and Eboracia (right) from the Middle Jurassic of North-Yorkshire (150 million years). This family still contains two extant genera: Matonia and Phanerosorus. The leaves of Matonia are composed like palm leaves. In the Mesozoic plants of this family were rather common, but only with a limited number of species. An example is the genus Phlebopteris (photo on the right) from the Lower Jurassic of the Bayreuth region (200 million years). Two genera remain nowadays from this family: Dipteris (11 species) and Cheiropleuria (1 species). The leaves often show a reticulate venation, reminding somewhat of modern flowering plants. An example of a fossil is Dictyophyllum (photo on the left) from the Lower Jurassic of Bayreuth (200 million years). This order, named after the polypodies (Polypodium), includes many known genera and goes back till into the Cretaceous. About 80% of all now living ferns belong to this group, which is considered to be one of the most 'modern' ones. In the root mantle of the tree fern Tempskya from the Upper Cretaceous (90 million years) rootlets have been found of a fern from this family. Very few fossils of these water ferns are known. They originate possibly from the late Cretaceous (80 million years). Within the group of the true ferns three radiations (periods of coming in existence of new types) occurred in the course of time. - in the Late Cretaceous and the Paleocene: before and after the great extinction at the end of the Cretaceous (65 million years) the advanced modern families and the modern genera appeared. This development was more or less synchronic with the rise of the flowering plants (angiosperms). It is certainly possible that new niches were created as a consequence of the changes, which offered possibilities for new fern species. In most cases ferns have been of modest importance in the history of the flora, probably caused by their dependence of humid habitats. Still, there has been a period during which they were quite dominant. This was directly after the impact of the huge meteorite at the end of the Cretaceous (65 million years ago). Research on fern spores and pollen has revealed that ferns have covered the whole earth during a period of 10,000 to 100,000 years. Afterwards the flowering plants took the lead again. Taylor, T.N., Taylor E.L. & Krings, M., 2009. 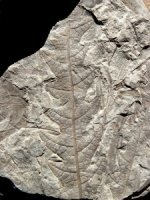 Paleobotany: The Biology and Evolution of Fossil Plants [2nd Ed]. New York: Academic Press.